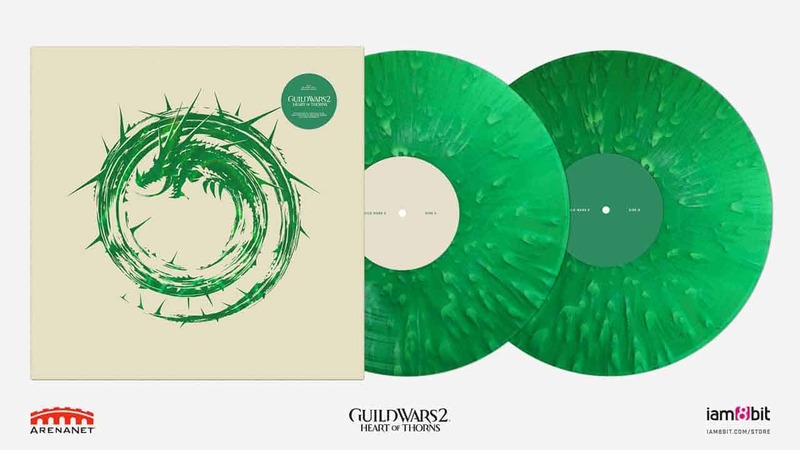 iam8bit and ArenaNet, publisher and developer of the acclaimed Guild Wars® franchise, have teamed up to release a special Collector’s Edition 2xLP Vinyl featuring the Guild Wars 2: Heart of Thorns™ soundtrack on 180-gram colored vinyl. The vinyl release offers fans a new way to experience the evocative, orchestral score composed by Maclaine Diemer and Lena Chappelle for Heart of Thorns, the first expansion for the fan favorite, best-selling MMO Guild Wars 2®. With audio mastered specifically for vinyl by Telegraph Mastering Studio, listeners can revisit their quest to battle the vicious Elder Dragon Mordremoth as the orchestra takes them through the perilous Maguuma jungle with the special release of this enchanting soundtrack. The vinyl features vivid artwork from the Guild Wars 2 art team with a design by game industry favorite, Cory Schmitz. And as an added bonus, a digital download code for the entire soundtrack + bonus tracks are provided with every purchase of the vinyl set. Analog + digital – in one package! The Guild Wars 2: Heart of Thorns vinyl will be available exclusively from the iam8bit online store (store.iam8bit.com or store.iam8bit.co.uk) for pre-order starting December 15 at 10 a.m. PST/6 p.m. GMT. This exceptional release honoring the magic of Guild Wars 2 is a collector’s item that will be treasured by all players, from charr to sylvari, from this world into the next. Long Live Destiny’s Edge! It’s also the first time the Heart of Thorns soundtrack will be available in its entirety, as well as on vinyl.